This article is shows you how to install and set up Code::Blocks and GCC on Windows. Do not follow this article if you are on Linux or Mac. 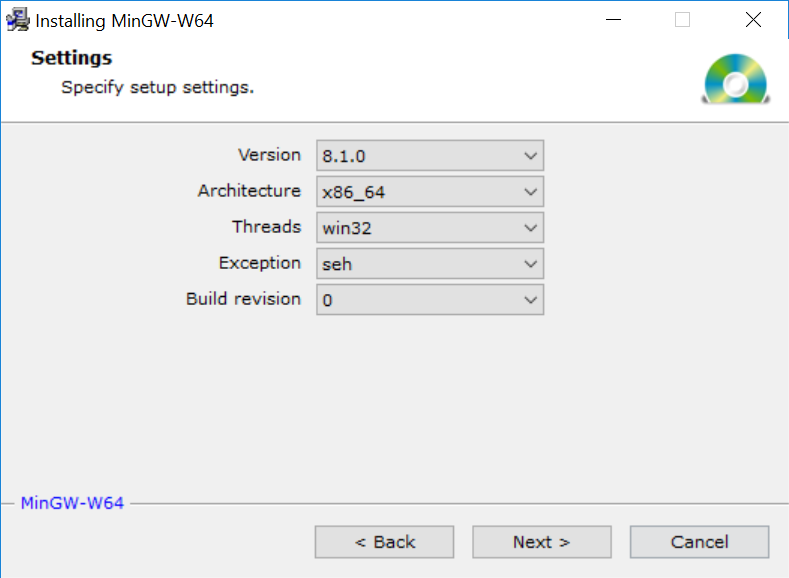 Install mingw-w64. Run the Windows installer (https://sourceforge.net/projects/mingw-w64/files/ — “MinGW-W64 Online Installer”). If you have a 32 bit Windows, select i686 as architecture. Make sure that you have GCC installed, preferably a version \(\ge 7\). To see which version you have installed, simply run gcc --version from the terminal. Download and run the installer from Sourceforge. You don’t need to change any of the installation options, the default ones are fine. Select “Yes” to run Code::Blocks now. When you run Code::Blocks for the first time, it asks you which compiler it should use. Just hit ‘OK’, we will configure the compiler manually. Select ‘No’ when asked whether you want to change the file extension policy. Next we will set up the compiler settings. Click on Settings>Compiler. Select Cygwin GCC. (Yes, we are not using Cygwin, but the minGW64 compiler executable names match those from Cygwin.). First of, click on ‘Set as default’. Now hit ‘OK’. If the compiler asks you about enabling compiler flags, click ‘Yes’. You’ll get an environment error in the bottom right, talking about ‘GNU GCC’, but you can safely ignore it, as we set the compiler to ‘Cygwin GCC’. Try running sudo apt-get install codeblocks. On some versions of Ubuntu, this installs an ancient version of Code::Blocks. (Version 13.12) If that is the case, try the following commands instead to get version 16. Next, follow the instructions for Windows, but use ‘GNU GCC’ instead of ‘Cygwin GCC’. Download and unzip the SOI project template from here. (If you’re on Ubuntu, instead use the version here.) Open your Code::Blocks installation directory (In my case C:\Program Files (x86)\CodeBlocks) and navigate to share\CodeBlocks\templates\wizard. In there, you should find a bunch of folders (‘arduino’, ‘arm’, ‘avr’, …). Copy the ‘soi’ folder from the zip file into the wizard folder. (The resulting folder path should look something like C:\Program Files (x86)\CodeBlocks\share\CodeBlocks\templates\wizard\soi.) We now also need to register the template. Copy config.script from the wizard folder to your desktop. Copy config.script from your desktop back to the wizard folder, overwriting the existing file. If you’re asked about admin rights, agree to continue. At this point, you should reopen Code::Block, so that it registers the project template. The path to the wizzard folder should be /usr/share/codeblocks/templates/wizard/. On order for you to be able to edit the files there, you’ll need to run file manager with sudo. (sudo nautilus from the terminal.) Other than that, you can follow the instructions for Windows. To create a project, click on ‘File>New>Project…’. Select ‘A SOI task’ and hit ‘Go’. On the next page, name the project and select a folder to create it in. You probably want to create an empty folder to place all SOI-projects in. To open the cpp file, uncollapse the Sources folder and double click on <projectname>.cpp. The project also contains two sample inputs, you can find them in the Others folder. You can ignore the Headers folder. To build, click on the yellow gear. (Hotkey: Ctrl-F9). Console: Read from console input. If the compilation fails, you can see the error messages at the bottom. Double clicking on one of them then shows you the line where the error occurred. Before running with GDB, click to the left of the first line of your main function. This creates breakpoint and a red dot will appear. Next, click on the red arrow to run with GDB. (Hotkey: F8) The program then starts and breaks at the breakpoint. At this point, we can set up the GDB perspective. Click on the icon with the bug and select ‘Watches” and ‘Call stack’. You can the move the two windows to a more convenient place, such as the left hand side. If you ever get asked to save the perspective, click “Yes”. Now we’re ready to debug. You can use the icons on the debugger toolbar for various thing. At any point, we can see the current variables and the function on the stack on the left hand side.